Preparing a Christmas tree for the stand is fairly simple. After brushing off the excess pine needles outside, all that is needed is a trim and reopening of the cut. Freshly cut trees are the safest to guard against premature drying, which increases the risk of the tree's catching fire due to hot Christmas lights. Keeping the tree well hydrated also extends its life, so preparing the tree for proper intake of water is crucial. Clean the tree stand with soapy water and a bleach solution to kill any bacteria or pests that may cause the tree to rot in the water. 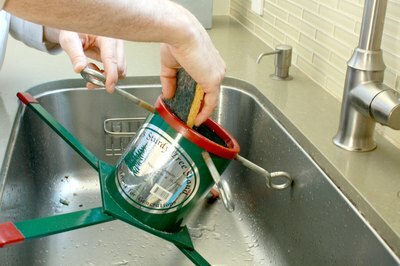 Rinse the stand thoroughly with water, and let dry. Trim the small bottom branches on the tree trunk with garden shears or a small saw. The bare trunk of the tree should be at least 1 foot in length before you insert it into the tree stand. Saw off 1 inch of the trunk's length to allow for water intake. After the first cut, the tree's sap pools to form a seal, like a scab on a wound, so for the tree to soak up water and keep from drying out, the seal must be broken. Place the tree in the stand. 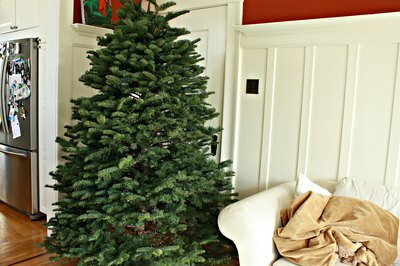 Adjust the tree so that it sits evenly and straight before securing the screws against the trunk. Fill the stand reservoir with water, and monitor the level daily. 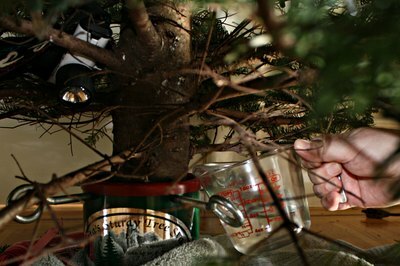 Christmas trees should be watered every one to two days to keep the needles hydrated and avoid the chance of fire.